There are plenty of ways to celebrate the father in our lives. Once my children were old enough to make their own decisions they decided not to take the traditional route of gifting a necktie, but to give their father what he wants most, time with his children. This year Father’s Day also falls on my husband’s birthday so he is expecting his kids to pull out all the stops. I’m not sure they can make everything on his wish list come true, but they are doing their best. 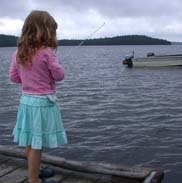 The Long Lake Fish and Game Club is hosting the annual fishing derby on the shores of Long Lake Town Beach on Saturday, June 18. The Bass and Pike Fishing Derby is open to everyone. Registration is $25 with the event open for registration at 6 am and fishing from 6:30 am – 3 pm with cash prizes for Pike, Largemouth and Smallmouth Bass. Only fish that are caught in Long Lake are eligible. According to Long Lake Fish and Game Club Organizer Bruce Jennings the event specifically aligns with the opening of Bass and Pike season. Since this event is more celebratory in nature the rules are "more loose set-up instead of a strict fishing derby. The Catch and Release event takes place at Long Lake Town Beach. People do not need boats to participate. Jennings sees people casting close to the beach and along the causeway each year. "We've been doing this fishing derby for approximately 12 years, " says Jennings. "We usually get between 30-40 people and it gets bigger every time the word gets out. With the opening of Bass and Pike season, the derby attracts dedicated fishermen. " Another fun fishing derby is the Saranac Lake Fish and Game Club's 29th Annual Father's Day Fishing Derby. Saranac Lake Fishing Derby Chairman Theresa Trudell confirms that the free event is for children only. Parents, guardians and caregivers can assist the children, but the derby is for anyone under sixteen years of age. The Sunday, June 19 event is offering gift certificates to Blue Line Sports for 1st and 2nd place in each of the four categories. "There are also tagged fish remaining from the March Colby Classic. If those tagged fish are caught during the winter event, the winner received $100. Any remaining tagged fish caught within the calendar year can bring the tag to Blue Line for a $25 gift certificate," says Trudell. "The derby starts at 8 am at Lake Colby. The categories are Bass, Trout/salmon, Perch and Sunfish. Most people fish directly from the shore, but some people do choose to put a boat in at the launch and get out into cooler waters." 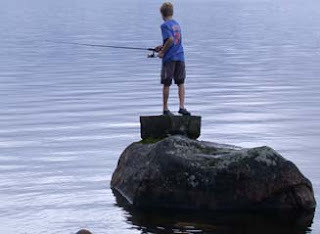 The Lake Champlain International Father’s Day Fishing Derby, June 18-20, is a different type of event with a registration fee and big prize money to the winner. Online registration is closed, but there are retail registration stations all along both shores of Lake Champlain. Anglers have the opportunities to win a boat, cash prizes as well raffles during the three-day affair.